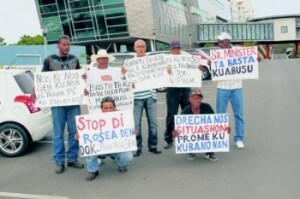 WILLEMSTAD – Employees of the Curacao Dry Dock Company (CDM) have protested for the first time in public against the government. The group represents more than three hundred employees who said they have been exploited for years now. Caribbean Network was present at the scene and made ​​a report. The abuses were identified at the time but were never resolved. The group was fired in 1993 and was rehired the following day as part of an employment agency. In addition, they lost all their social benefits and were paid two guilders per hour less for the same type amount of work. In 2011, the government, under pressure from legal action, entered into an arrangement with the employees. It was agreed that an amount of about seven million dollars would be released in compensation for the last five years. Part of that money was paid, but the group is still waiting for the last part, about 3.5 million guilders. Spokesman for the group, Anthony Arroyo said that the group is not looking for trouble, but indicated that the Minister of Economic Development, Stanley Palm has now limited room for maneuver. This action is just the beginning, according to Arroyo.